Ethiopia follows the Julian calendar, roughly seven years behind the Gregorian (the country just welcomed year 2007 on September 11, 2014) , consisting of 12 months of 30 days each and a 13th month of five or six days - the only country in the world with 13 months. This uniqueness is well-suited to this East African nation which is full of delightful facts - enjoy some of them below. (special thank you to Africa - Mail and Guardian, Samantha Spooner). 1. Coffee Homeland: Coffee, one of the world’s most popular beverages, was discovered in Ethiopia, in the region of Kaffa - the province which gave coffee its name. Today, Ethiopia is Africa’s top coffee producer and exporter. 2. 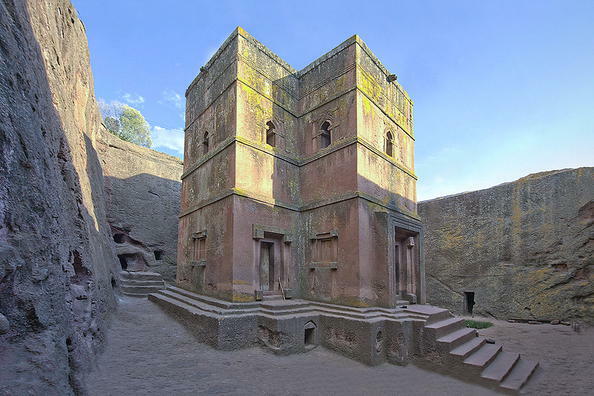 World Heritage gem: Ethiopia is home to nine UNESCO World Heritage sites, more than any other country in Africa. The fortress-city of Fasil Ghebbi - one of the UNESCO World Heritage Sites - was the residence of the Ethiopian emperor Fasiledes and his successors in the 16th and 17th centuries. Gondar - was founded in 1635 by Emperor Fasil as a capital of Ethiopia known as Abyssinia during that era -was home to a number of emperors and warlords, courtiers and kings. And it is one of Ethiopia's largest and most impressive towns today. 3. Cradle of Mankind: In 1974, anthropologist Professor Donald Johanson and his student Tom Gray discovered “Lucy”, 3.2 million-year-old “Australopithecus afarensis” - in a maze of ravines at Hadar in northern Ethiopia. In December of 2000, Ethiopian scientist Zeray Alemseged discovered the most complete hominid skeleton ever found in the world, in the Dikika region of Ethiopia. The fossil was older than the remains of "Lucy" and described by scientists as one of the world's greatest archaeological finds. The new bones belong to a three-year-old girl who lived 3.3 million years ago - 150,000 years before Lucy. The fossil has been named "Selam," which means peace in Ethiopia's official Amharic language. 3.2 million year old "Lucy"
3.3 million year old "Selam"
4. ‘Immune’ to colonialism: Ethiopia has never been colonized by a European power. In March 1896 a well-disciplined and massive Ethiopian army did the unthinkable—it routed an invading Italian force and brought Italy’s war of conquest in Africa to an end with the battle Adwa. Between 1936 and 1941, Mussolini’s Italy briefly occupied the country. 5. Urban Hyenas: The Capital of Ethiopia, Addis Ababa, is currently plagued by urban hyenas. These carnivorous animals have moved into the city from the surrounding hills and taken up residence. It is estimated that there are now between 300 and 1,000 of them living in the city. 6. Lots of cows: With approximately 52 million head of cattle, Ethiopia has the largest livestock population in Africa. South Africa’s national commercial cattle herd is estimated at 13.5 million. 7. Special baboons: Ethiopia is home to the Gelada Baboon. This fascinating animal is in fact, not a baboon at all, but an old world monkey classified in its own genus. It is the last surviving species of ancient grazing primates that were once widespread in Africa. 8. Unique script: Ethiopia is the only country in Africa with its own unique script. Commonly called “Ethiopics” it is widely adopted throughout the country and used by almost all the languages spoken in Ethiopia. It has more than 260 characters, 10 numerals and several punctuation marks. 10. Landlocked giant: With a population of approximately 97 million, Ethiopia is the most populous landlocked country in the world. 11. High Addis: At an altitude of 2440m, Addis Ababa - one the fastest growing metropolises in the word – is Africa’s highest city and the third highest capital in the world. 13. First gold: Derartu Tulu was the first woman from Africa to win an Olympic gold medal, doing so in the 10,000m sprint event at the 1992 Barcelona Olympics. 14. Biggest dam: Ethiopia is currently constructing the Grand Renaissance Dam on the River Nile near the Sudan border. When completed, it will be the largest dam in Africa. 15. Super food: Ethiopian food is gaining popularity worldwide. Today, an Ethiopian restaurant can be found in almost every major city. The super-star of Ethiopian ingredients is the teff grain, now poised to be the world’s next “superfood”. It is a nutritious, gluten-free alternative to wheat that has fed millions of people for virtually thousands of years.